A 60-year-old man was seriously injured Tuesday night after being pinned between his pickup truck and a semi-truck at a Fife truck stop. The accident happened in the later evening at Love’s Truck Stop in the 1500 block of Port of Tacoma Road. The News Tribune reports that it appeared that the man had backed into an area designated only for semi-truck so he could put air in one of his tires. The driver of the semi did not see the man and struck him as he pulled away, pilling the man between his pickup and the semi’s rear axle. A tow truck was called to pull the wreckage apart so paramedics could tend to the wounded man. The man was taken away in an aid car with severe injuries. Detectives are looking to speak with any witness’ from the scene because this was not a designated area for passenger vehicles. Washington State gets a high volume of trucking traffic on interstates such as I-5, I-90, I-82 and I-84. Unfortunately semi-truck collisions happen frequently in our state. 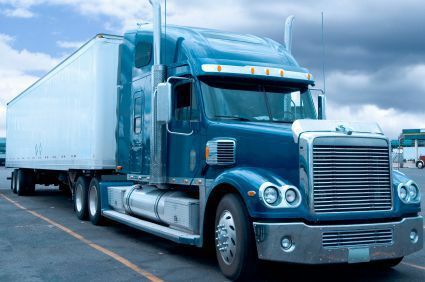 Truck drivers are often required to deliver their cargo on a very strict schedule which can result in long hours on the road with little or no sleep. Exhausted or distracted truck drivers often cause major accidents, like this one. If your car is hit by a semi-truck, the trucking company’s insurance will most likely come into play at some point. Federal law requires interstate commercial trucks and other vehicles to have bodily injury liability insurance, in the event of an accident or collision such as this one. This insurance is designed to provide compensation to accident victims, as the trucking company is legally obligated to pay them for their injuries and related costs if one of their drivers is at fault for causing the injuries. For a person that is injured in an accident with a commercial vehicle, there will likely be multiple potential sources of insurance coverage. An experienced personal injury attorney will be able to help identify which parties could be held liable for the accident, as well as whether their insurance policies will adequately cover all the damages that the victim has suffered.